I usually leave the Newsletter narrative to other (more eloquent!) 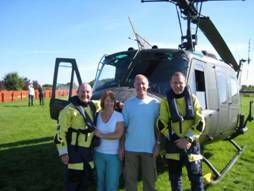 members of the Huey Crew attending an event and just for once ‘volunteered’ (?!?) 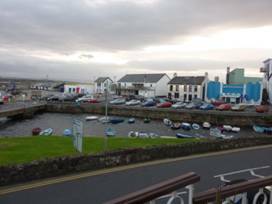 to do this narrative for Portrush – so please accept this as a one off and normal service will be resumed shortly! (Unless my arm gets twisted any further by my PA Becky as she has constantly harassed (nagged!) me for the last 6 months to get this written!) 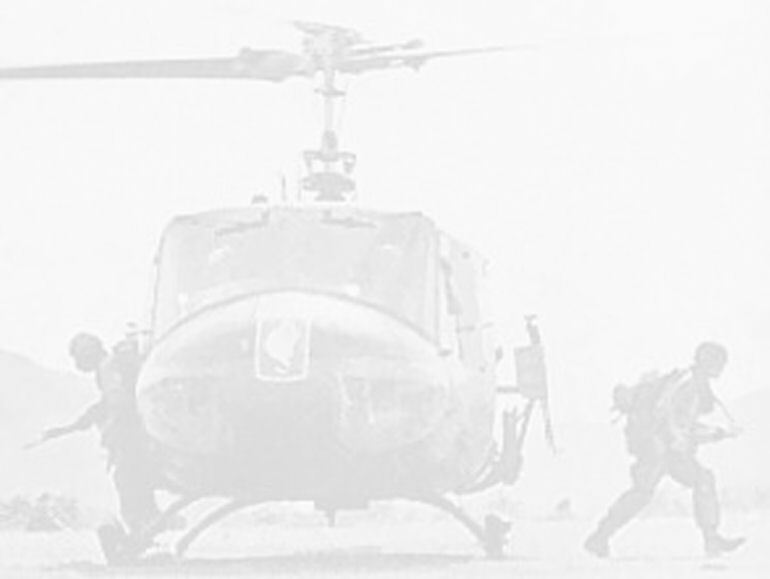 My excuse for the lapse in time is that I have to work long hours in my full-time job to ensure that everyone enjoys the thrills and spills of the Huey and I struggle to find enough time to lay down the Event Reports! So, with my excuses out of the way …. Originally we were supposed to fly out to Portrush on the Thursday 3rd September 2009 so that we would be present for a press launch for the Northern Ireland Airshow as agreed with the organisers. Unfortunately the weather was too bad to consider our departure to get across the Irish Sea therefore we had no choice but to wait for the weather to turn so that we could fly out on the Friday instead. I should add at this point that I remember I was suffering at that time from acute back pains from a trapped nerve so whilst the weather sat on top of us I disappeared to my GP to get painkillers….. I remember the words of my GP “Don’t drive while taking this medication” to which I jokingly replied piloting isn’t driving! ‘The Doc’ firmly pointed his finger at me and said “NO!”. Therefore ‘struggling on through my pain’ (now you can see why I don’t tend to do these write ups!) 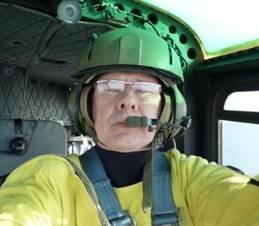 and getting back to the hangar to explain the situation to Keith, he reluctantly volunteered to fly the Huey across with me for company! All I can say is that having taking the medication prescribed, left to me we could possibly have ended up in the Orkney Iles but thankfully we relied on the good old GPS. The weather had improved sufficiently to fly out on Friday but there was a strong head wind. The flight across the Irish Sea should have taken 1 hr 5 minutes however at some point in the middle of the Irish Sea we were passing the Isle of Man Heysham Ferry and that looked to be going faster than we were! We arrived at Newtownards 1½ hrs later, Huey with her tongue out needing fuel, receiving the usual fantastic welcome there Huey having been a visitor before. On departing Newtownards it was decided that flying direct to Portrush was a no-no due to low cloud on the hills. We elected to go around the coast but the prevailing wind was giving us a problem and the air speed was down again. At one point we almost turned back; we got to the point of Ulster’s Grey Man and the weather was definitely iffy … our choices were to turn back to Newtownards or to go out to sea to Rathlin Island. 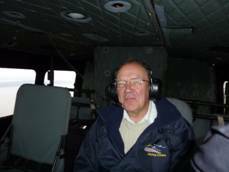 We went further out to sea which gave us a clearer view of the coast line and battled through to Ballykelly where there was a rapturous welcome for Huey 509. We were not alone in our adventures over the sea as other flight and display crews had done the same journey. We quickly put Huey 509 to bed and disappeared back to the Hotel to enjoy the Airshow organiser’s excellent hospitality (Keith’s was a whiskey…mine was a painkiller)! It was noted by the organisers that Mr Connolly had a crooked back but as expected, no sympathy was forthcoming. It was a wonderful meal and we had the company of the Guinot (Wing Walker) Girls … very pretty but their sanity must be called into question for walking on wings of a bi-plane!!). Saturday dawned and we turned up at the Huey, did the A Check to make sure all was okay; no problems there so Keith went off to do the Flying Display for the Airshow which was excellent received. The weather was 100% improved from the day before and all went according to plan. After the display Keith returned Huey 509 to Ballykelly to a warm welcome once again and we were treated to some of the best hospitality known that evening. Next day the weather did not give us much confidence - even though early morning weather was flyable the warnings for 2 pm onwards were particularly bad. We did agree to do 2 slots for the Airshow if some of the other aircraft found it difficult in the conditions but after some chopping and changing, and conditions not improving, Keith carried out our planned display and came back in. The weather by 4 pm had deteriorated to a level whereby it was impossible to get home to Lancashire. After much deliberation we made the decision to reposition the aircraft to Eglington Airfield, to leave Huey 509 there for a week and return for her the following weekend so that Keith and I could catch scheduled flights back to the UK otherwise we would not have been back in time to go to our full-time employment. So we secured Huey at Eglington where all the airport officials and staff were brilliant and assisted us in every way. Special thanks to John Lavery. 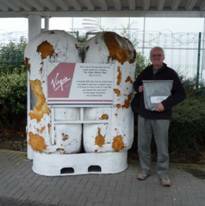 It was interesting to see that outside the terminal building sat one of the fuel tanks from Richard Branson’s Atlantic balloon crossing. The balloon landed 4 miles East of Eglington Airport which is why this is placed here – ballooning being ‘one of’ Keith’s hobbies. We arranged a flight back to Gatwick for Keith and to Liverpool for myself and then a taxi home…it had been a long day. All told a good Airshow weekend but such a pity about the downcast weather! 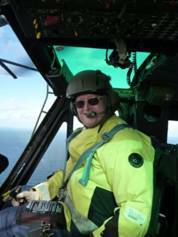 The following week we kept an eye on the weather forecasts for the following weekend which looked really good for the return to collect Huey and fly her back. Neil Airey volunteered to join me to bring her back as some old friend’s of his from military days would be in the Newtownards area. Saturday came with a taxi ride to Liverpool Airport and a direct flight to Londonderry. We met Neil’s friends, Eric and Anne, and arranged with the airport security to get them out to the Huey for a closer look. I carried out the necessary A checks, Neil did the navigation and within 45 minutes the good old girl was up and running taking a direct flight from Londonderry to Newtownards for fuel. In comparison to the previous weekend’s weather it was absolutely stunning …. couldn’t have wished for a better day! 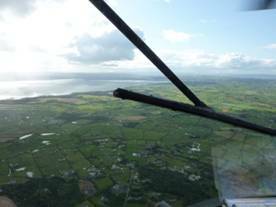 Within minutes of taking off and getting over the first hills we could see the city of Belfast and beyond Newtownards. We arrived at Newtownards and this time being a Saturday afternoon there were a lot of aircraft enthusiasts which kept us talking for at least 2 hours. The time came for us to depart so we donned our very uncomfortable but absolutely essential offshore survival suits to make the trip across the Irish Sea. 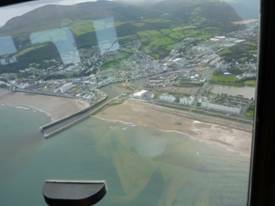 Once again a brilliant flight with crystal clear visibility and as soon as left the coastline we could see the Isle of Man and then the Blackpool coastline in the distance. We arrived into Blackpool Airport to refuel and to return the survival suits which were on loan to us from the Offshore Helicopter Terminal to whom we say a big “Thank You”. We headed off back to home and put the old girl back to bed. She had performed absolutely impeccably.